I just moved back to Bangalore, and since I’d gone through a period of no-time-for-knitting, I was itching to get something started. I’d carried back a part of my yarn stash with me, so I had the materials ready to make two cardigans — one for my mom, and one for my sister. I’d spent my knitting break period thinking about how I’d like the cardigans to turn out (of course, subject to potential modifications based on preferences of my “customers”. 😉 ) While talking to my sister, she expressed interest in a summer sweater. Perfect for the eyelet patterned raglan cardigan I’d been thinking of! Yeah, there you go. My sister liked it (or rather, she didn’t dislike it), so I started diving into the details. 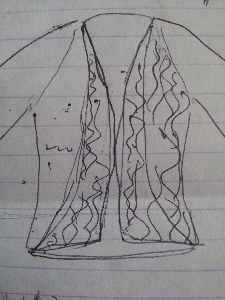 As the sketch shows, the pattern needed to extend in both directions — towards the neck when neck increases are worked, and towards the body according to the “sweeping” (I really should use a different word for this) design. I’ve been knitting on my merry way the past few days, and the cardigan pattern, with the intended symmetry and the calculated increase points, is coming along nicely. More updates in my next post. This entry was posted in Cardigans, In-progress, Knitting, Sweaters and tagged Eyelets, Patterns, Raglan, Top-down. Bookmark the permalink. Wow, that is beautiful!!! Can’t wait to see the finished product. Thank you for the comment and the follow, CrohnieGal, I’m pretty excited about the project as well! You have some great projects going on your blog too — I’ll keep an eye on those! 🙂 And good luck with your treatment. Thanks very much 🙂 I’m impressed that you are creating your own patterns?! Wow! I’m just novice. Started knitting last year. So much to learn still. But having a lot of fun doing so. I find it very meditative too. Welcome Anita 🙂 Glad to have some company out here. Cool. Will check out her blog too.